It has been sooooo hot here the last week and the high temperatures (mid to high 90's) are going to continue into next week. With no rain in sight. We usually have a mild summer with temperatures in the low to mid 70's. I'm not complaining. I love hot summers. the east coast. He gave them to me to do what I wanted with them. Since it was so hot I decided it would be better to just serve them cold. 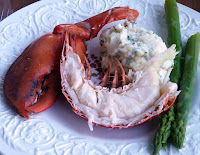 I made a potato salad and cooked and chilled fresh asparagus to go with the lobster and I mixed up my favourite seafood (Remoulade) sauce. It was a lovely evening so we dined outside on Clif's porch. As a starter Clif served steamed artichokes with a garlicky dip and then we had the lobster. TIP: To make it easy for everyone to eat the lobster, I removed the claws and tails. And, then, cut the tails down the middle using kitchen scissors and used a cleaver to crack the claws. Dessert was a big plate of fresh cut fruit. Pineapple, Cherries and watermelon. This is my recipe. I use it on cold seafood plates. Usually with crab claws, baby shrimps, prawns, lobsters and avocado salads. Taste and adjust to suit personal taste. If you like Horseradish, add more, or more mustard. My husband would LOVE this. Heck, I would too! Oh dear, I'm practically drooling over your gorgeous lobster dinner. 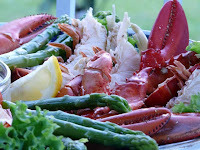 We have wonderful crab here in the Northwest but there is nothing like lobster anywhere near. Your remoulade sauce sounds wonderful. I can at least make that to serve with shrimp and crab. Yum, yum. I moved from the East Coast, 2 yrs ago, and they have the best lobster. The weather is so warm compare to last year. But I like it so much. My daughter is freezing in Ottawa. Monica, it really was good. Cathy, Dungenese crab is available here year around and it is a real favourite of ours. 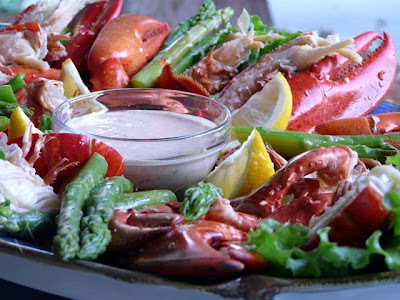 Live Lobster is also available but it is shipped in from the East coast. Helene, the best lobster I've ever had came out of the cold waters off of Newfoundland. Sounds like you're having our summer, and we're having yours - nothing but rain, rain and more rain (New Brunswick). 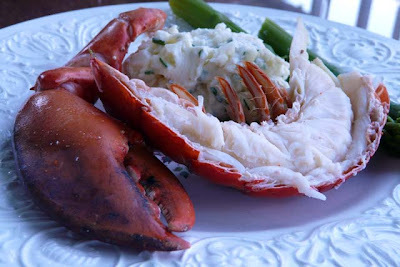 If you like lobster recipes, I've got more here: http://www.lobsterqueen.com/lobster-recipes.html. Thanks Christina, One can never have too many lobster recipes.